This volume is available as a audio CD and a downloadable MP3. 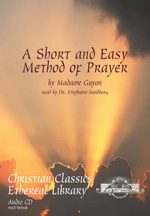 A Short and Easy Method of Prayer by Madame Guyon gives simple instructions in contemplative prayer, prayer without words or distinct ideas. It also encourages readers to accept all things as from God’s hand. Jeanne-Marie Bouvier de la Motte-Guyon (commonly known as Madame Guyon) (1648-1717) was a celebrated French mystical writer of the Quietist school. This little book was written for a few individuals who wanted to love God with their whole hearts, and as others wanted a copy, it was committed to the press. It quickly went into multiple printings. Since then this work has been widely distributed and very influential—to places as far as China, where Watchman Nee gave copies to new converts. At the time, which was a rather stormy era in French religious history, the work resulted in her being attacked and defended by some of the most brilliant writers of her day, even resulting in her imprisonment for a time. The work continues to attract strong defenders and critics, but many find in it a fruitful way to seek God. This little treatise, conceived in great simplicity, was not originally intended for publication. It was written for a few individuals, who were desirous of loving God with all their heart. Many, however, because of the profit they received in reading the manuscript, wished to obtain copies, and, on this account alone, it was committed to the press. It still remains in its original simplicity. The whole is submitted to the judgment of the learned and experienced; requesting them, however, not to stop at the surface, but to enter into the main design of the author, which is to induce the whole world to love God, and to serve Him with comfort and success, in a simple and easy manner, adapted to those little ones who are unqualified for learned and deep researches, but who earnestly desire to be truly devoted to God. An unprejudiced reader will find, hidden under the most common expressions, a secret unction, which will excite him to seek after that happiness which all should wish to enjoy. The narration is by Dr. Stephanie Sandberg, a Professor of Theater at Calvin College in Grand Rapids, Michigan. Dr. Sandberg teaches theatre history, acting, directing, and spends a good deal of her time on the development of new plays. The cellist is Peter Plantinga and the audio technician is Gerard VanHalsema. Your purchase of this recording helps fund the further development of the Christian Classics Ethereal Library.